I like to paint. It’s more of a compulsion actually. Even when I’m sitting in traffic or watching a movie, I’m mentally painting. It’s pretty much always been that way so I guess I was born to paint. The thing I really love is light; trying to capture it is the challenge of a lifetime, whether it’s falling on a mountain or bathing a figure, glistening on the petals of a rose or penetrating a wave, all I want to do is catch it and keep it forever in my paints on a canvas. The fact that a visual experience can be directly shared by and through one person to another, bypassing all barriers of language, mechanics, culture, even time, is completely remarkable. To participate in such a thing is an awesome privilege and a joyous challenge; I’m very proud to get to live the life of an artist. I have oriented my whole life toward artistic excellence, that I might be able to express my vision well. 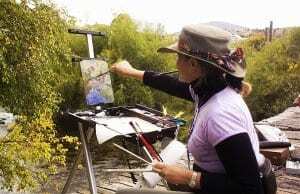 I have studied with great masters, including David Leffel, Everett Raymond Kinstler, Quang Ho, Qiang Huang, Jeremy Lipking, Scott Burdick, Sue Lyon, Clayton Beck, Dan Gerhartz, Carolyn Anderson and Kathryn Stats. I belong to the Salmagundi Club, the American Artists Professional League, Artists’ Fellowship, American Impressionist Society, the Portrait Society of America, the Outdoor Painters’ Society, and Oil Painters of America and am represented by RS Hanna Gallery in Fredericksburg, TX. I plan to always continue my studies of the great masters who have come before us, passing on what I learn to my students so that everything that’s been poured into my life keeps right on going. I hope my life leaves a meaningful mark.